A face-off win in the defensive zone, a minor scramble leads to a breakout from longtime Swedish national team linemate Loui Eriksson to another longtime teammate on both the international and domestic side in Alex Edler who rifles a stretch pass to Daniel Sedin. The all time leading goal scorer in Canucks history now finds himself on a two on one as he comes down the wing, given that fact a shot wouldn’t be out of the question but tonight roles are reversed, he feathers a pass across perfectly to the man on the other side – his twin brother, life long teammate and the other half of one of the greatest duos in league history – Henrik Sedin. As the gap between himself and the opposing goalie closes he opts for a quick deke before sliding the puck past his ex teammate and the man he inherited the captaincy from – Roberto Luongo. Just like that in perhaps the most storybook way possible. 1000 points. 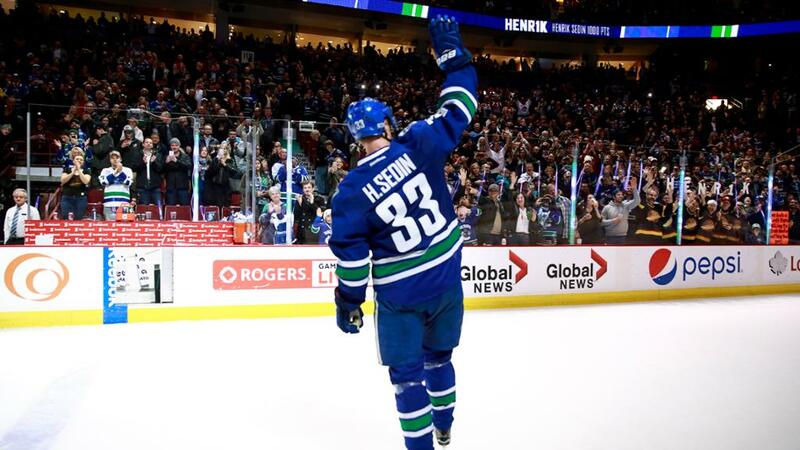 You would be hard pressed to find someone in the Sedins early years who would believe you if you told them that Henrik Sedin would be one day become one of only 85 people in the century old history of the National Hockey League to join the 1000 point club (with Daniel likely following close behind). The two hailing from small town Ornskoldsvik Sweden came to Vancouver fresh faced and with a mountain of expectation placed upon them to produce given their high draft positions. Immediately it’s clear, this isn’t Sweden anymore, this is the big leagues. The early years would be tough as they struggled to find their footing scoring only 30-40 points a year far from the pace expected from future impact players let alone 1000 point scorers. Labelled soft and nicknamed the “Sedin Sisters” by detractors, they persevered eventually receiving the bulk of the scoring responsibility as the Markus Naslund -Brendan Morrison – Todd Bertuzzi West Coast Express faded and handed the reigns down to the two twins. Elite production followed as the two exchanged scoring titles in back to back years capped off by a Stanley Cup run that came heartbreakingly close to glory. Suddenly the mockery became less vocal, they had arrived, perhaps not as soon as fans expected but it’s better late than never as they say. What is amazing upon reflecting on Henrik and Daniel’s career is how genuinely unique they are as a pairing. Some players scare you because they have a rocket shot, great hands or incredible speed but the Sedins scare the opposition with their smarts. Never the fastest or the strongest but the two seem to have telekinetic powers and superhuman durability (Henrik at one point played 679 consecutive games – 7th longest in NHL history). When operating at full capacity they can leave the other team chasing for a full two minutes as they cycle the puck before they find that one perfect pass that leads to an inevitable goal. Dubbed “Sedinery” by the fanbase they have made a number of players look far better than their skill set would otherwise dictate (Jason King, Trent Klatt, Taylor Pyatt, Anson Carter, Alex Burrows etc.) making the spectacular happen on any given night. Of course, Henrik is as humble as ever quickly noting how his favourite part of the historic moment was his teammates getting to be apart of it so in true Sedin fashion maybe it’s fitting that this piece is less about Henrik the individual and more on the brothers as a unit. The city of Vancouver is fortunate to have you, Canucks fans worldwide are lucky to get to watch you work your magic nightly and hockey fans everywhere should cherish it while it lasts for there may never be a duo like this ever again. Oh Captain, My Captain. Today you reached a milestone, as unlikely as it once seemed, There is only one thing left on every fan’s bucket list: The Stanley Cup. Is it unlikely? Sure, but if anyone has a history of defying the odds its you.